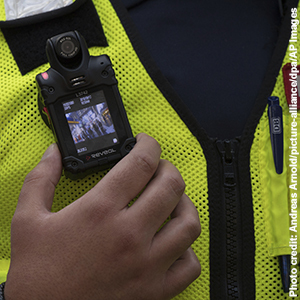 A new OSHA bulletin addresses hazards associated with small, wearable devices powered by lithium batteries, such as body cameras. If these devices are damaged or defective, they may catch fire or explode. Employers should ensure that workers are trained to properly use, store, and charge these devices; identify, remove, and properly dispose of damaged or defective devices and batteries; and provide information on their health and physical hazards. A lithium battery-powered body camera.